Red Bull – that sticky sugar and caffeine-tastic drink that youngsters like to mix with vodka – is moving inexplicably into the mobile network business. Details are still a little vague but T3 discovered they had it seems that they’ve partnered up with Sony Ericsson and Nokia to provide the network on several of their handsets. A site www.redbullmobile.com promises “the latest handsets, competitive tariffs and a complete package of mobile communication features”. It all sounds like a play on their cunning advertising campaign about how all that red-coloured liquid “gives you wings”. Now it gives you a network contract too. The whole turbo-boosted high-energy plan could go down well in the mobile network provider market. Quite a few mobile networks could do with several shots of caffeine, but we don’t know yet whether Red Bull will really stand out or just be a small player with a gimmicky brand association. It seems Red Bull currently has two flavours of tariff on offer: a €19 (£14/$28) per month option and a €29 (£21/$43) monthly package. Both include different, but generous, amounts of minutes, texts, web access and unlimited access to Red Bull TV. 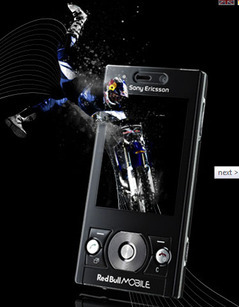 The five handsets, include the Sony Ericsson C702, Nokia’s 5800 and ZTE’s RBM1. Dom Perignon MOBILE? – really expensive. But really good. Tetley tea MOBILE? – slow, probably no internet data included, but reliable and cheap. Smirnoff MOBILE? – brilliant for 3 hours then drops calls, breaks up and dies. Herbal tea MOBILE? – you can only access the network when you’r near a cat or a copy of the Guardian. That’s all for now. This could get silly.